MELBOURNE defender Tom McDonald has denied he is putting contract talks on hold until the end of the season but says he's in no rush to re-sign with the club. McDonald, who is out of contract at the end of 2016, also said there was no link between his own indecision and Jesse Hogan's pending contract status. Hogan, whose contract expires at the end of 2017, has shelved plans for an extension until the end of the year as he considers whether his future is at Melbourne. "I'm not putting off contract talks until the end of the year, or, as some people have said, waiting for Jesse Hogan to make a decision – that's not true at all," McDonald told AFL.com.au. "I want to focus on playing good footy and that (the contract) can be worked out along the way." However, the key defender said his loyalty lies at Melbourne and the Demons' hope is that Tom and his younger brother, Oscar, can help form the club's spine for the next 10 years. "I just hope they don't see me in a different light because I haven't got a contract sorted yet. I'm not too worried about what others are saying about me on the outside," McDonald said. "I hope the club rates me and thinks of me as a long-term player at the club, but that's to be done behind closed doors. "I'm loving playing at Melbourne this year and I've got such great mates here. That (contract situation) can be worked out at a later date." McDonald has been disappointed with his form in the first half of 2016 and hopes he can turn it around against a Travis Cloke-less Collingwood at the MCG on Queen's Birthday Monday. Twelve months ago, McDonald was firmly in All Australian calculations after a scintillating start to the year, in which he claimed the scalps of Jeremy Cameron, Nick Riewoldt and Lance Franklin. 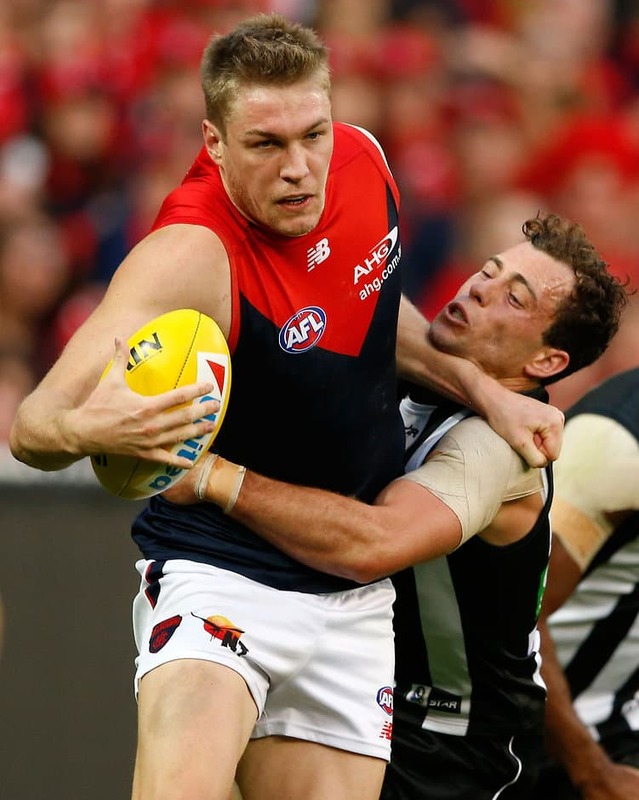 The 23-year-old is still averaging 17 disposals per game in 2016, as the Demons play a more proactive version of the 'team defence' system that has become commonplace across the League. "I am a little bit disappointed in some of my work over the last couple of weeks," McDonald said. "I've got to be better in my contest work. I've been a bit flimsy defensively a couple of times, and that's really disappointing because over the last few years that's what I've built my game on. "That part is the biggest area to focus on this year and the other stuff follows on once I get that right." Melbourne has allowed the eighth-most points per game (96.7) of any team this season, but McDonald and the Demons are confident they can adjust to the different form of defence. "We're trying to limit teams taking the ball into our defensive 50. Traditionally we've always had high inside 50s against and we really want to limit that," McDonald said. "We're trying to get the ball turned over quicker and doing that can be a little risky but when it comes off, we do it really well." McDonald said he had been impressed with Oscar's development, but said it would take the 20-year-old some time for his body to catch up with the role the Demons want him to play. "Oscar's been thrown into the deep end, which can be tough as a young fella, but I think he's done a really good job considering how much pressure he's been under," Tom said. "We need to have a bit of patience with him because long-term he's going to be a pretty good player for the club."